Gorilla Shot or Boy Saved? 03 Jun Gorilla Shot or Boy Saved? On Saturday a four year old boy fell into the gorilla enclosure at the Cincinnati Zoo. The boy was dragged into a mot by a 450 lbs. silverback gorilla named Harambe. 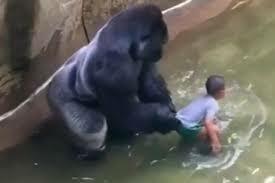 In order to rescue the boy the zoo had the gorilla shot. I’m sure you have heard all about the incident. The story was all over the news and social media exploded with blogs, tweets, and posts. Animal rights activists were furious and animal lovers all over the country mourned the loss of the 17 year old gorilla. And now five days later we are still talking about it. It seems the whole country is looking for someone to place the blame on. Many are calling the mother “negligent” and believe she should be investigated. Some blame the zoo for making the wrong call. And some even blame our whole society for having the animals on display in the first place. I have to say that after the whole Leon the lion incident I am not surprised that the death of a gorilla has been the top news story for the past few days. And I expect that it will continue to fill my news feed for another week or so. To be honest I am upset as well. But not about the gorilla. I am upset and troubled by our society’s misplaced compassion. Compassion has been defined by psychologists as “the emotional response when perceiving suffering and involves an authentic desire to help.” Most psychologists believe that compassion is a natural human instinct. Many studies show that infants who are too young to have learned socially constructed reactions or responses have displayed compassion when they are shown another in distress. It is clear that our society as an overwhelming amount of compassion. But I can’t help but notice that it is often selective or misplaced. For example, when America watched the video of Harambe, the 450 lbs. gorilla, dragging a four year old boy through the mot a large number of people felt no compassion at all for the boy. Why are we more worried about an animal than a human? Let me give another example: abortion. We know that the baby’s heart begins to beat 3 weeks after conception. A babies brain waves can be detected 6 weeks after conception. And nine weeks after conception all the structures necessary to feel the sensation of pain are functioning. Abortion terminates the life of a baby but we can’t stop it because American’s feel sorrow for the mother. We are told things like “we don’t know her situation” or “she doesn’t want to be pregnant” or “it’s her body and her life”. The truth is it doesn’t matter how sad her situation might be, our emotional response should be triggered by the fact that a human baby, with a beating heart, is being killed. Why do we have compassion for the situation of the mother but not the death of the baby? These are just two examples. Unfortunately we have stories of misplaced or misdirected compassion throughout society today. How did our compassion get so misdirected? This is a very complicated issue and I am sure that there is more than one answer or solution to the problem. But I believe that at the root of this problem we find a lack of religion. You see in religion there are constants such as right and wrong, true and false, good and bad. These constants are nonnegotiable and they provide the believer or follower with standards to live their life by. These constants also dictate the believer’s emotions and responses. Though compassion is a natural human emotion that we are all born with, it is fed by our beliefs and shaped by our world view. When religion is removed emotions such as compassion can be molded and constructed by social media, politicians, friends, movies, books, literature, etc. Is it sad that the gorilla was killed? Yes it is. Is the life of an animal more important than the life of a human? No it is not. It is time we reshaped our world view and put things in perspective. The gorilla incident is not a world changing event. It is simply a reminder of where our priorities are. It is a wake up call to evaluate our understanding of what is truly important.